US $3,500,000	Need Finance? Need Insurance? If a track record sets the standard this Yard presents a podium finish. Since the late 1960s the Little Hoquiam Shipyard has been combining the finest materials, technology and know-how to produce in excess of 220 superbly crafted custom vessels. 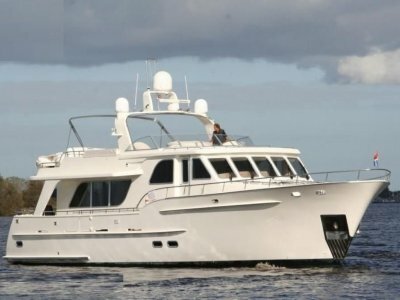 Both commercial and pleasure craft at exceptional value in the 60 to 120 foot range. The Boat Yard spread over 11 acres comprises 60,000 square feet of undercover buildings including, production, administration and design. It provides state-of-the-art capabilities in fiberglass, wood and metal fabrication. The yard also has its own launching docks. 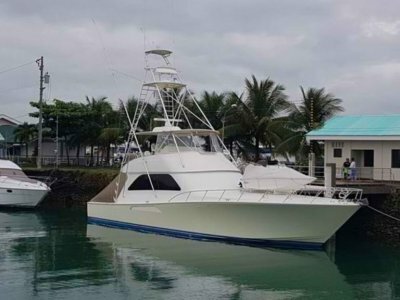 The 65ft Yachtfisher is a custom build featuring a modified Vee-hull w/keel, hard chine and transom stern, w/bulwarks and finished in gel coat White Colour. Construction is F. R. P. Composite hull w/chopped mat and woven roving in polyester resin with Airex core, and stiffeners. Propulsion is supplied by twin MAN V-1200 engines. The Owner and their representatives, will have full access to the vessel in the production yard throughout the build process during working hours. Engines: 2x MAN V-1200,@ 2500 RPM Main Engines: Two Caterpillar MAN V-1200,1200HP marine diesel engines shall be installed, equipped with fresh water cooling, heat exchanger, seawater pump, oil and fuel coolers, 24 volt electric starting system. All fuel lines shall be one wire rubber hose. Engine installation shall be approved by engine manufacturer. Marine Gears: Twin Disc 5145A hydraulic reverse reduction gears with trolling valves. Ratio shall be 2.0:1 reduction. Engine Sumps: Engine sumps beneath engine shall be white gel coated finish. Engine Mountings: Main engines and generator set shall be installed as per plans. All pipe and electrical connections to engines shall be flexible. Engine foundations shall be fabricated from aluminum and mounted on the F. R. P. Engine stringers. Shafting: Water lubricated propeller shaft installation. Aquamet 22 shafts, 3-1/2" diameter. Heavy molded-in F. R. P. Stern tubes with dripless stuffing boxes, and rubber cutlass bearings. Propellers: The propellers shall be nibral, (4-bladed) 34 dia.. Vee struts to be stainless steel with rubber cutlass bearings. Generating Sets: Two 20KW 1800 RPM Northern Light marine diesel generator sets shall be fitted with ventilated and easily removable sound shields, heat exchangers, freshwater cooling, 12 volt electric starting systems and 55 amp alternators located in the engine room. A separate 12V starting battery shall be fitted for each generator. Cooling Water System Engines: Main and auxiliary engines shall have fresh water cooling systems with heat exchangers, oil cooler, and seawater pumps. Raw water intakes, strainers, and piping shall be in accordance with Builder's standard practice. Engine piping shall be bronze or stainless steel with double-clamped hoses to engines. Shower faucets shall be single lever Kohler. Sink faucets to be single lever Kohler. Day head to have shower w/floor drain. Galley and bathrooms shall be ventilated by 110 volt AC extraction fans, controlled with timer switches. All towel bars, glass holders, basin tub fixtures, soap dishes, toilet paper holders, robe hooks, etc. Shall be supplied by the Builder. Installation shall be done by the Builder and positioned as directed by the Owner. Toilet system shall be Headhunter and shall be installed by the builder. Galley and bar counter tops, and splashes shall be Swanstone w/color as specified by Owner. Shower stalls and shall be molded fiberglass, off white color. Each cabin shall be provided with a 5 lb. ABC fire extinguisher located as directed by Owner. Engine room shall be provided with one 1000 FE241 fixed cylinder with alarm. Two-wheel steering stations shall be located in the pilothouse and the flying bridge. Electronic, twin Disc single lever controls at the pilot house, flying bridge and aft deck stations. Items with an asterisk(*)indicate flying bridge installation in addition to pilot house. Builder shall supply a layout drawing of the console and the positioning of instruments, controls, electronics, etc. Special attention shall be given to human engineering for sight lines and ease of operation. Chart area with maximum dimensions shall be provided. One chart drawer shall be built in pilot house settee. One helmsman chair and Storage cabinet with shelves and drawer for miscellaneous equipment. If a track record sets the standard this Yard presents a podium finish. 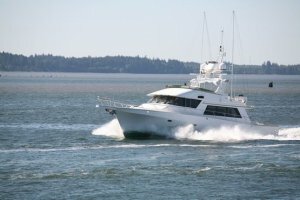 Since the late 1960s the Little Hoquiam Shipyard has been combining the finest materials, technology and know-how to produce in excess of 220 superbly crafted custom vessels. 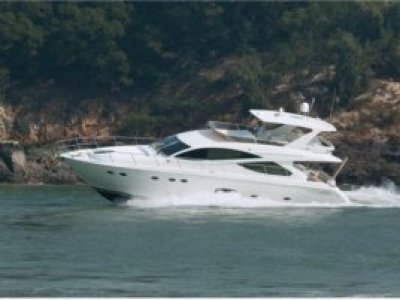 Both commercial and pleasure craft at exceptional value in the 60 to 120 foot range. The Boat Yard spread over 11 acres comprises 60,000 square feet of undercover buildings including, production, administration and design. It provides state-of-the-art capabilities in fiberglass, wood and metal fabrication. The yard also has its own launching docks. 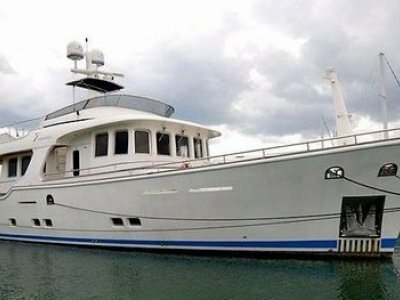 The 65ft Yachtfisher is a custom build featuring a modified Vee-hull w/keel, hard chine and transom stern, w/bulwarks and finished in gel coat White Colour. Construction is F. R. P. Composite hull w/chopped mat and woven roving in polyester resin with Airex core, and stiffeners. Propulsion is supplied by twin MAN V-1200 engines. The Owner and their representatives, will have full access to the vessel in the production yard throughout the build process during working hours. Type of vessel: Modified Vee-hull w/keel, hard chine and transom stern, w/bulwarks. Finish to be gel coat White Color. Construction: F. R. P. Composite hull w/chopped mat and woven roving in polyester resin, Airex core, and stiffeners as required. Exterior and Interior Styling and arrangements per plans. Architect: Little Hoquiam Shipyard with design support from Jonathan Moore, NA. All construction shall be kept as light as possible, consistent with strength required. Hull bottom and topsides shall be laminated with multiple layers of woven roving and chopped strand mat as specified on the lamination schedule. Outside and Inside skin of hull will utilize orthopthalic resin. All bilge areas will be coated with gel coat. The hull bottom and topsides shall be cored with structural foam. The hull will be framed using molded FRP stiffeners and web frames. All framing members, except watertight bulkheads, shall incorporate limber holes to insure free drainage to the bilge sumps. Limber holes shall be arranged so that bilge water cannot accumulate in isolated pockets. Decks, house sides, house tops, and flying bridge shall have a smooth FRP exterior finish and may be of cored construction, or wood framed construction to suit design requirements. Bulwarks above the main deck shall be fully sealed box section over internal stiffening frames. Internal face shall be molded fiberglass sheet. Hull and all exterior fiberglass shall be polished gel-coat finish. Bottom (from boot stripe down)shall be sealed with blister-resistant barrier coat, and painted with two coats of anti-fouling paint. Name and hailing port shall be painted on the transom per Owners instructions. Colors and feature stripes as specified by Owner. Applied Silica sand and gel coat finish is to be provided on all walking surfaces. Layout and arrangements as per general arrangement drawings. All interior joinerwork shall be executed in accordance with the drawings and with good marine practice. Every effort shall be made to prevent weight build-up in joinerwork construction. Drawers shall roll on heavy metal guides and have means of positive closure in a seaway. Cabinet face frames, door frames, and other items of solid wood shall be constructed of cherry throughout the vessel. All hanging lockers shall be of red cedar 1/4" plywood. Doors shall be of solid edges, with plywood panels, rectangular in shape. Door frames shall be solid wood. Interior deck/main deck floor flats shall be constructed of plywood over wood beams, or cored FRP panels to suit design requirements. Exterior decks shall be laminated with multiple layers of mat and roving, cored with 1" 5 pound foam core. Primary structural bulkheads shall be constructed of cored FRP or plywood with FRP lay up on each side in bilge areas. Hull to be insulated with blanket insulation in stateroom areas.